As you walk up the Miners Track evidence of mining can be seen around you. Although there are rumours, but no confirmed evidence, that mining may have started here under the Romans, the first recorded mine here was in the early 1800's. During the mid 18th century demand for copper began to rise, and it people though it would be worthwhile to take it out of the ground - one such use was for copper bottomed warships. But no one ever got rich taking copper from Snowdon as the costs of extracting and transporting the ore ate into any profits. 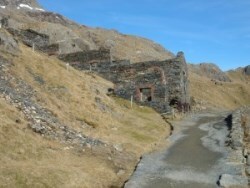 The mine is located at Cwn Dyli, and its ruined crushing mill can be found on the shore of Llyn Llydaw. There was a storehouse for the ore at at Pen-y-Pass, and the Pyg Track is thought to be the route the miners took the ore to the store to be dressed. The mine was worked intermittently, but not very successfully for just over a century, and many lost large sums or money or went bankrupt despite large amounts being invested in various ventures. Although known mainly as the Great Snowdon Copper Mine or Brittainia Copper Mine, the Brittania company only owned it from 1898, but sold it to the Penypass Copper Company in 1915 - and then it closed the year later in 1916. In all seven companies tried their luck over 100 years. Most of the buildings date from the latter half of the 19th Century - a barracks was built to house 100 men beside the lake which gives an idea of the scale the mine was worked on. Of the buildings that stand today the most obvious is the crushing mill beside Llyn Llydaw - a manager's house originally stood beside it. Originally a men, horses and carts used to cross Llyn Llydaw by raft, but in the mid 1800s the level of lake was lowered to build a causeway across the lake. This was prompted when a raft overturned - the horse drowned and a cartload of ore sunk to the bottom of the lake. Even the causeway wasn't quite safe enough - the postman for the mine (a retired naval rating living at Pen-y-Pass was apparently blown off the causeway and drowned in a strong gale. The causeway taken by walkers is not at the original level, but was raised in 1905 when the North Wales Power Company put in sluice gates to raise the water level. You are walking these tracks for fun, but the miners before you had another reason for walking up to the summit of Snowdon. Long before the roads were built copper ore still had to be taken from the mine to the sea - with initially no roads taking them round, miners had to carry the ore over the top of the mountain, and then use sledges to take it down the other side. If you start getting out of breath on your walk, just think about how much harder it would be to climb carrying the heavy ore with you, and spare a thought for those long ago miners! Some of the 8 levels remain, together with the remains of the Britannia mill Extensive workings can be found on several levels with interconnecting stopes. Some of the upper levels are now blocked, but it is still possible to pass from the top levels through to the bottom. However, most of the woodwork has obviously seen better days, and should be regarded with great care.